Whether you work, go to school or for many of us both, we can all agree this is a busy time of year. 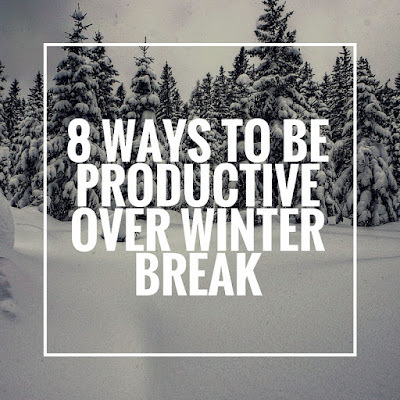 Between cramming for exams and the stress of the holidays this time of year can be especially draining. 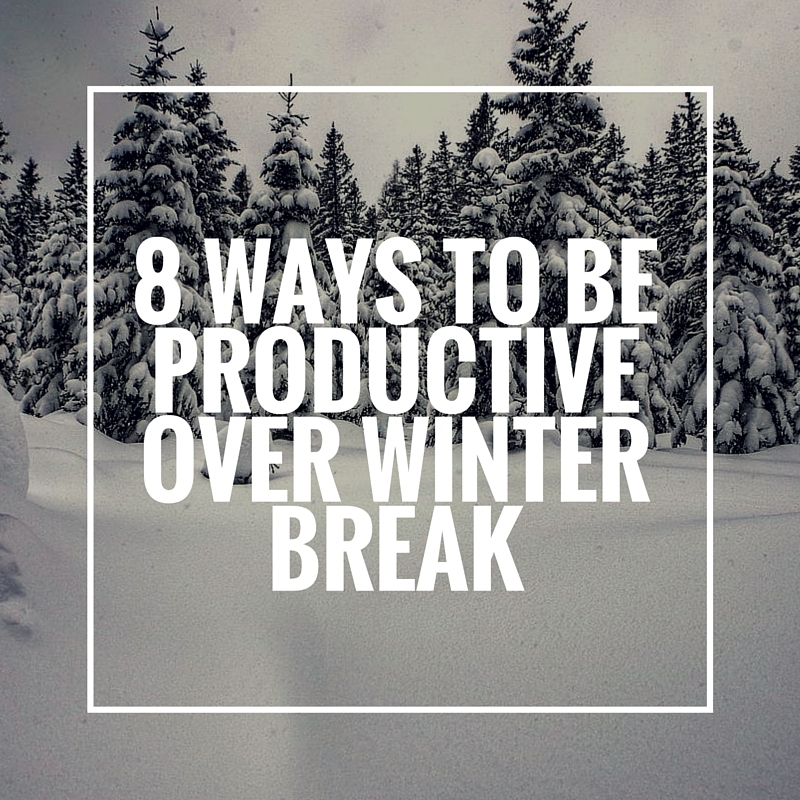 Whether you plan to travel the world, visit with family and friends, or watch your favorite TV series for 3 days straight it’s important to use your winter break to do things you don’t regularly have the time to do. Catch up on Sleep. It is no secret that getting 8 hours of sleep every night is one of the best things you can do for your mental and physical health. At the same time that’s easier said than done. During your days off make sure to get those 8 hours of sleep in. Do you need to see the dentist? Have you got your hair cut in the last few months? Do you need any refills on prescriptions? 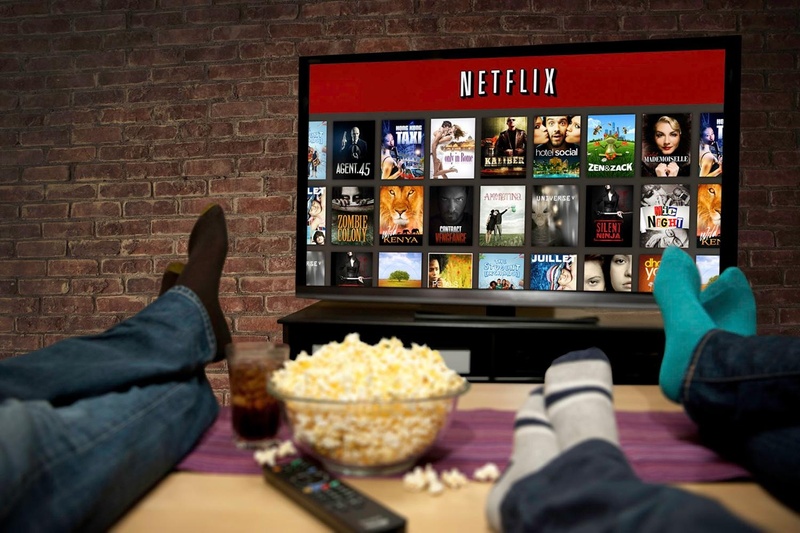 Sometimes you just need to watch an entire season of Orange is the New Black. For many of us it can be hard to plan ahead for what we’re going to eat for dinner much less plan what we’re going to be doing 5 months from now. 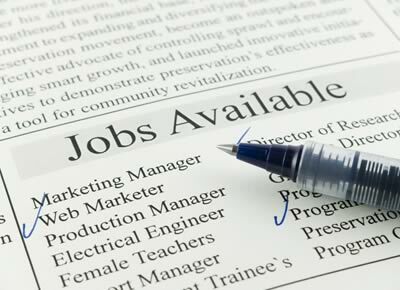 Use your break to update your resume and apply to jobs. Finding the time to perfect your “bikini” body can be difficult. 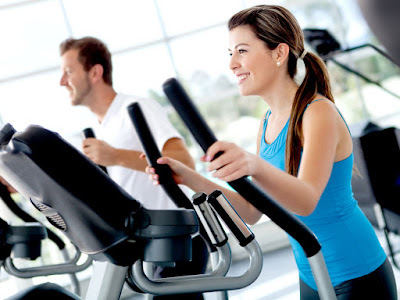 Play a pick-up game, hit the gym, or even go for a run. When you already don’t have time to sleep and work out, reading for fun can be a foreign idea to you. Maybe there is a movie you liked that’s based off a book or maybe your favorite comedian released something new? 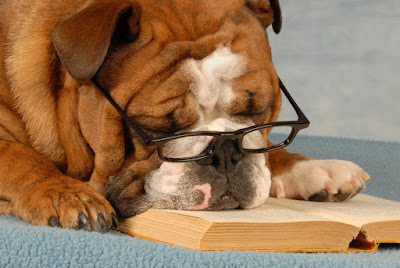 Pick up a book and read! Organize your fridge. 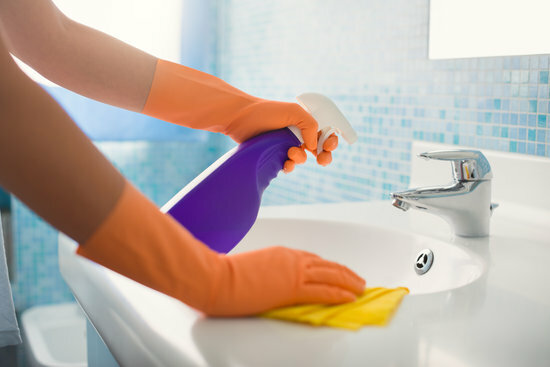 Take the time to deep clean your bathroom. Go through your closet and give away clothes that no longer fit. Create a to-do list for things you need to get done at work or prepare for your next semester of classes. As 2015 comes to an end, there are many things to think about going into the new year. One thing you can add to that list is college board's debut of a new version of the SAT beginning in March, 2016. 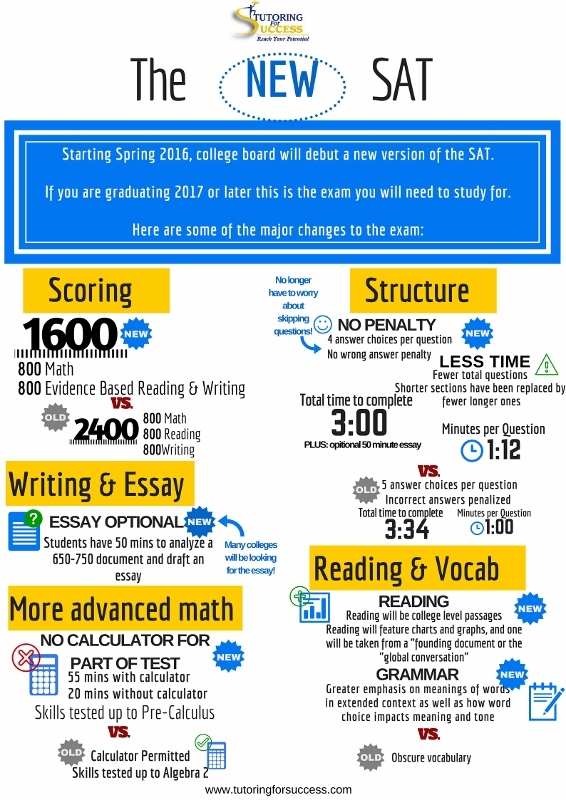 We've created an easy way for you to break down the differences between the old SAT and new SAT. Feel free to save, share, or print this graphic! If you haven't already, please follow us on LinkedIn and like us on Facebook. We post all kinds of funny and interesting things that you're going to want to share with everyone! One of the major challenges that parents face is getting their children to do their homework efficiently, with a minimum amount of stress. This is difficult for many reasons. Most important, parents can’t make their children do anything. What we can do is find ways to make homework a priority. We should talk to our children about their future plans, let them know that most people need a college degree in order to eventually earn the income necessary for a middle class lifestyle, and discuss the importance of working hard to learn and receive good grades. Getting started is the hardest part. Try setting everything up in advance and scheduling homework time and breaks. Scheduled things are more likely to get done. Work with your child to focus for ½ hour at a time with no distractions, and then have scheduled "distractions" for breaks and scheduled "free time" to reward homework completion. 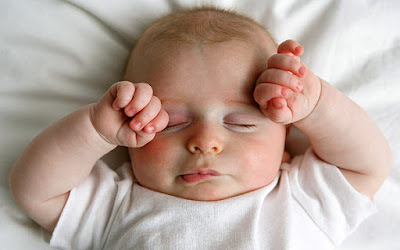 If the phone must be on, keep it in airplane mode or "do not disturb." · Predict how long each assignment will take and schedule time accordingly. Then see how long assignments actually took to improve future predictions. · Work with your child to break down lengthy assignments into manageable chunks. · Schedule study time for a time of day or evening when student can focus best. · Use a timer to make homework time more efficient. · Check phone only during breaks. · Have folders and binders for each subject and make sure everything is filed where it belongs. · Have a separate homework folder and make sure homework goes there after completion. Get help to improve study skills. 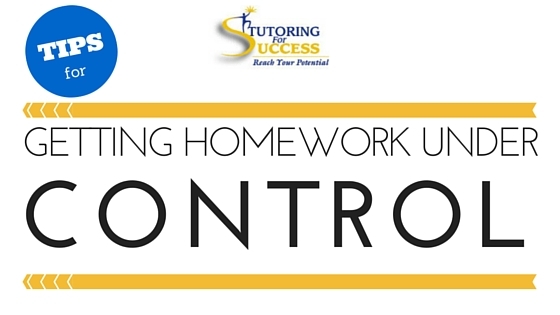 · Be consistent about homework time and set the space for focus without distractions. · Be available to help during homework time. · Recognize your children when they are effective. · If your child is dishonest about finishing homework, check it regularly. · Find ways to make homework fun and interesting. · Work with teachers to coordinate homework. · Hire a private tutor or academic coach. Since every child is unique, strategies that work for one child may not work for another. We need to be patient and help our children to limit distractions and manage their time better. We can do this with timers, rewards, breaks, breaking down material, helping to make their assignments more relevant and interesting, and being generous with praise and spare with criticism. 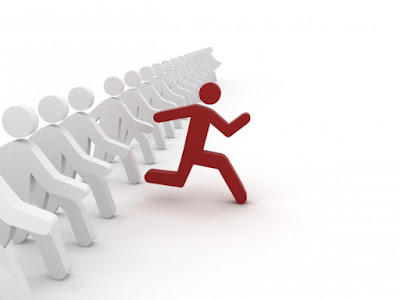 We are more effective as our children’s cheerleaders and assistants than as their adversaries. If your child is still overwhelmed, talk to the teacher. You may be able to get reduced or modified homework or help after school. You can hire a private tutor to help with specific subjects or an academic coach to help with time management, organization, and motivation. Ultimately, students will have to realize that if they want to succeed in school, they will have to come up with motivation and self control to resist distractions. The students need to be working harder at school than their parents work to get them to do their work. As a parent, you can help set up your child for success. And remember, students' brains develop on their own schedules. The pre-frontal cortex, the part of the brain responsible for planning, judgment, decision making, and self control, is the last to develop, and isn't mature until age 25 or so. Your child's self management will improve over time. Be patient. Feel free to print it and post it on your fridge or bulletin board as a simple reminder of our homework tips! If you haven't already, please like us on Facebook. We post all kinds of funny and interesting things that you're going to want to share with everyone! We hope the school year is off to a good start for your children. If your family is at all like mine, the first few weeks of school carry a great deal of transition and challenges. 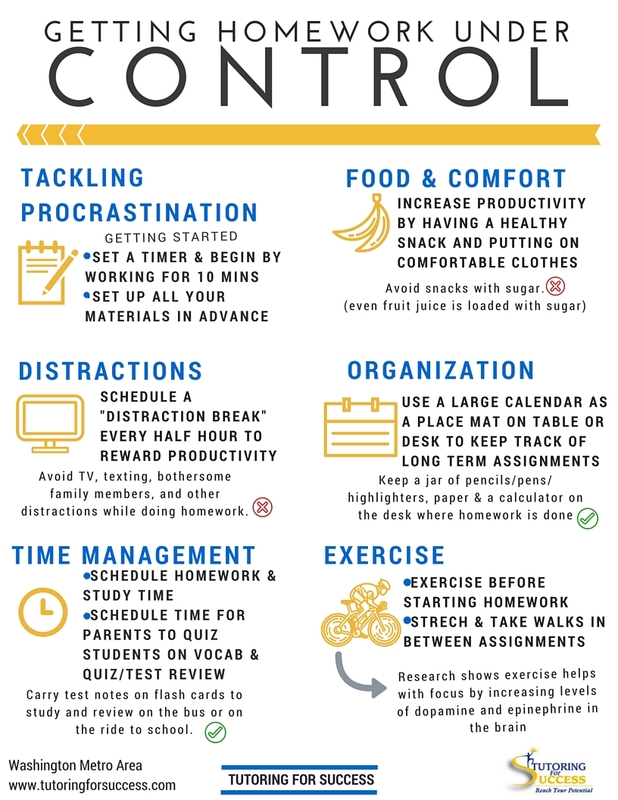 Many students find that they need help with organizing, time management, study skills, or some tough academic subjects. Last year USA Today ranked this app as one of the "Best Back to School Apps". It helps organize assignments and due dates and has a user friendly calendar to prioritize, track, and color code assignments. On the calendar you can also see anything that is due that day. If you're on a budget or this is your first time trying an organization-focused app then this would be a great one to try. 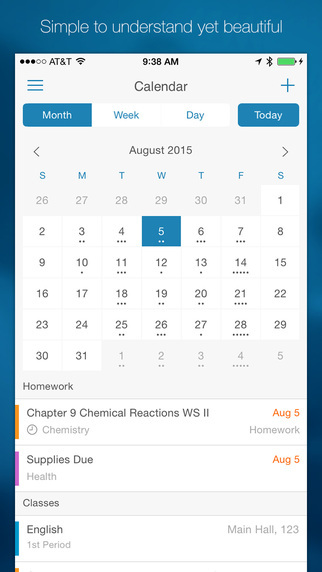 This app helps organize schedules and prioritize homework. You can also receive push notifications before assignments are due. It has 5 main functions; Overview, Assignments, Planner, Instructors, and Holidays. Students can include course schedules, plan study sessions, and prioritize assignments based on importance, among other uses. 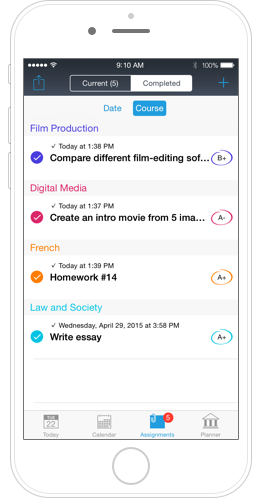 The app can also help students keep tabs on their academic progress by tracking their grades. Plus, this app can easily sync with all of your devices. 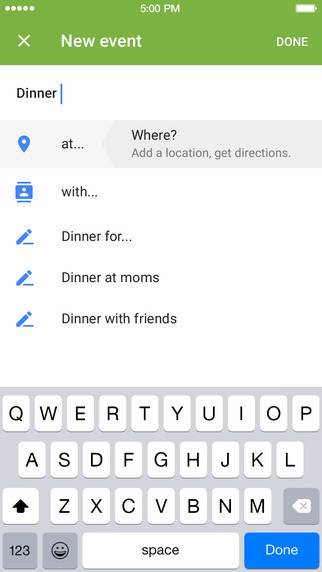 Take notes, track tasks, and save things you find online. 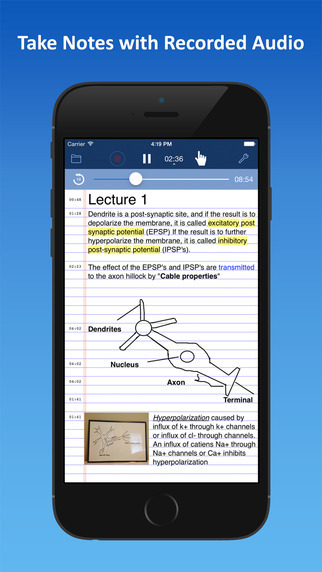 You can also set up a notebook for every subject. It has a function that allows you to make multimedia notes with pictures and audio. 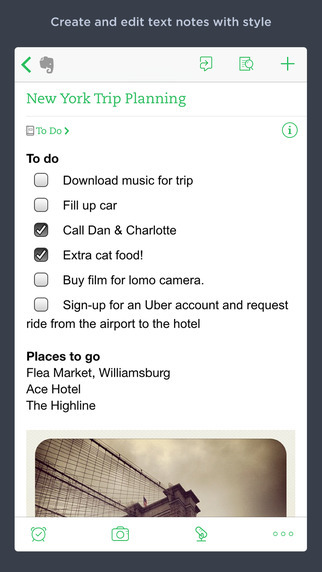 Evernote is a place to record and save all your thoughts, notes, and photos. Everything you do can be synced to the cloud so that you can get to all of it from your computer, smartphone, or tablet. It's a very popular app that is continuously being updated with new features. Audio note combines the functionality of a notepad and voice recorder to create a powerful tool that will save you time while improving the quality of your notes. You can syncs audio with notes. This app is especially useful if your student has something quick that he or she needs to remember but doesn't have time to type it. You can also free-hand draw an image on the screen, which can be useful for jotting down diagrams and pictures. My family loves Google Calendar! My daughters have their own calendars and they share them with me so I can help them prepare for upcoming assignments. You can organize your time, color code activities or tasks, repeat events, add notes, and view the calendar in different formats. You can also set up alarms for any upcoming appointments or due dates. Of course it syncs with all of your devices as well. Of course, if your child prefers pencil and paper, writing down schedules and to-do lists, and writing activities in a planner or on a large desk calendar also work. As we all know, being organized saves time and increases productivity, so don't put off this important task. One more thing! We have a wonderful selection of tutors and academic coaches to help your children if needed. If they do need help, it is best to get it sooner rather than later, when they may be even more overwhelmed or fall behind. Call us today at 703-390-9220 or email me directly at Cheryl@tutoringforsuccess.com and we can get you matched with a qualified and experienced tutor in your home today! Practicing A Language - Do You Need a Spanish or French Tutor? Who Controls your Life, you or your Phone? My name is Cheryl Gedzelman, and I am the founder and president of Tutoring For Success. Since starting the business in 1994, I have been committed to helping students succeed academically. Our philosophy is that with the right resources, all students can reach their full potential.